Introduction – Melacheri is a small village located near Gingee. There is a small cave excavation, which is always locked it seems. When I visited it was locked as well, when enquired with nearby people, it was told that it is opened only for few days in a year. Why this so, I don’t know. However when you put lots of efforts to locate such remote shrines and then you found those to be closed, how will you feel? The same feeling I had when I visited this site and found it locked. Interestingly, I even don’t know if this the correct site or not. Let’s see the details of the cave, as I have not seen this so what I am describing is wholly taken from reference books. Cave Temple – This cave temple is excavated in the western face of a small granite boulder, located to the north of the village. This seem to be a live temple, however the lock on the gates was so old and rusty that it seems that the gates are not opened from a long time. Locally this temple is known as Maddileshvara temple. There is a modern Murugan temple on nearby hill, which seems to be more in worship in comparison to this cave temple. The façade faces the west and is opposite to an irrigation tank. 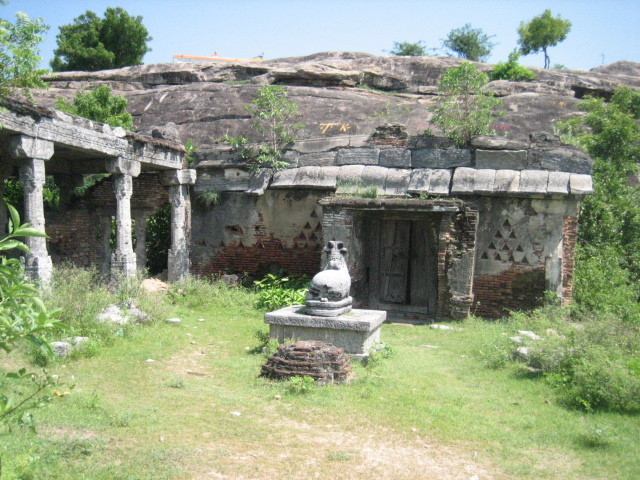 This rock temple is hidden by a later addition of brick mandapa in front of the cave. In the center of the cave are two pillars, and two pilasters which are square throughout. This arrangement divided the cave into three partitions of equal size. The corbel above the pillars is in angular profile, not in curved or Taranga (roll) profile as seen in other Mahendra shrines. On the back wall of the entrance hall, 19.75 feet long, 8.75 feet wide and 6.75 feet high, is cut a cell, which is entered through a oblong opening. The cell inside is cubical of size 8.5 feet. It houses a Shiva lingam, which is cylindrical in form and resting on yoni pedestal. The pedestal is about 4.75 feet above the floor level. 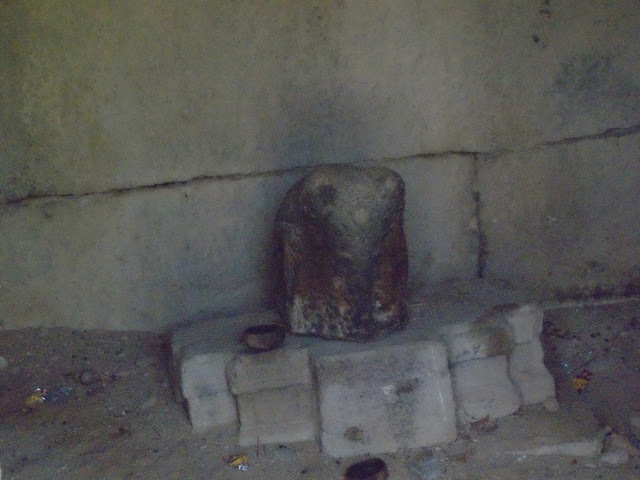 This stone Shiva lingam is carved from the original rock, a feature not seen in any other Pallava cave of Mahendra or later time. There is a lotus carved on the ceiling just above this lingam.The north wall of the cave has a niche cut into and there stands an image of Parvati. From the style of the sculpture, this looks like a later addition. There is a bas-relief of Ganesha in the extension of the southern wall of this cave temple. This also is assigned to later times by many scholars. Strangely these niches were not described by A H Longhurts, but later by K R Srinivasan. There are few shrines built opposite near to this cave temple. A Nandi is placed now facing opposite to the cave temple as well. Most of the external shrines are empty, one has an elephant, mount of Murugan, but Murugan is missing. There is a very interesting legend for this. 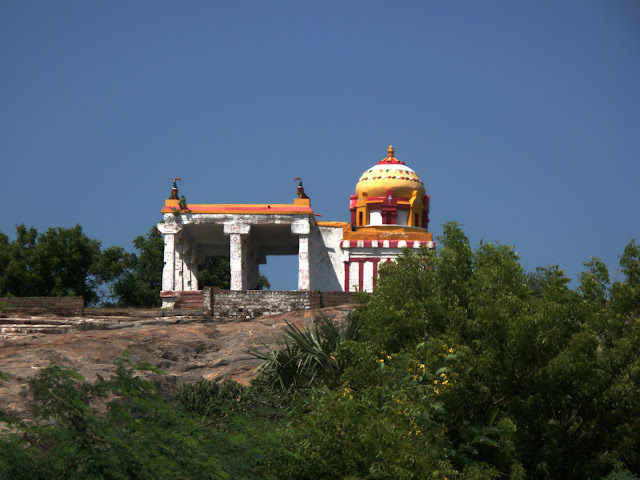 Murugan (Kartikeya) wanted to go to the hill, where now his modern shrine is located. However his mount, elephant, refused to climb up as it was tired. Of course the mounts are given enough freedom to express their feelings. Anyway, Murugan has a good fleet of vehicles, so he called his another mount, peacock, and expressed his desire to go over the hillock. Peacock was happy to hear as he got chance to carry the lord and also get equal with the other mount, the elephant. Murugan reached at top and was fascinated with the view and hence he expressed his desire to stay there for some time. To commemorate this a shrine was built, where peacocks are placed on four corners over the roof. The elephant is still waiting for Murugan inside the temple near the cave. So this was the mystery of the lonely elephant inside the shrine at ground level. Looks funny, or original? Do you believe this legend, if yes then please don’t believe as I am making stories here, hahaha. This idea of legend came to my mind when me and Shash were visiting this site. I told him about this and promised that I will surely write about this in my blog, so I am just fulfilling my promise, please don’t get angry. Dvarapalas of the cave – No dvarpalas found in the cave. Translation – This home of Shiva named Sri-Sikhari-Pallaveshvaram, was caused to be made at Simhapura (Singavaram) by king Chandraditya who was a sarvanatha. Singavaram is a village nearby and has a cave temple attributed to the Pallavas by many scholars. However there also we do not have any Pallava inscription to support the assignment. Here, in Melacheri, we have a Pallava inscription, but who is this king named Chandraditya or Sikhari? We have not seen these two names in any inscription of the Pallavas. Then who this could be? K R Srinivasan suggest a connection between Chalukya and Pallavas of Mamalla time. We know about a Chalukyan king Chandraditya, son of Pulakesin II, who was contemporary of Mamalla. However we also know that Mamalla assumed the title of Vatapikonda where he defeated Pulakesin II only. Did they go into matrimonial alliance after this defeat? A possibility is proposed where queen Vijayamahadevi, of Chandraditya, is supposed to be a Pallava as usage of Tamil words in her inscriptions. However this hypothesis is supported on a very lean and weak thread so cannot be taken in account with conformity. Let’s try the solution out from architectural perspective, Singavaram has a cave temple dedicated to Vishnu and Melacheri has a cave temple dedicated to Shiva. Both are similar in some aspect, on their pillar style and corbel style. Can the same king, Chandraditya, was responsible for both the caves? How to Reach – Melacheri is about 5 km north-west from Gingee town. You may ask the local people at Gingee, there is road going from the main state highway to Melacheri, via Singavaram. As the temple is quite inside so please keep asking local villagers. Better ask for the Murugan temple on hill, as they recognize this modern temple rather than the cave temple. There is another village with same name, Melacheri, near Seeyamangalam. So if you are planning to visit Seeyamangalam and then Melacheri then please do not get confuse with this another same name village.